WOLTERS KLUWER KFT. , Megjelenés: 2014. december 22. "In 2013 the Media Studies Research Group established by the Hungarian Academy of Sciences launched a research programme entitled “The fundamentals of European thought on media law, with special respect to certain issues related to the freedom of speech”. The programme’s aim is to define the fundamentals of European thought on media law, to identify the possible models for the resolution of the various questions that arise, to understand the “common minimum” of European regulations that is present in all countries and to establish whether “best practices” exist in these areas and, if so, what they are. 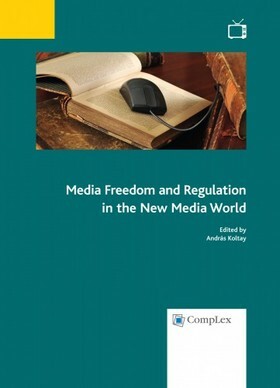 The Academy invited distinguished scholars from many countries working in the field of media and free speech law to take part in the research programme and send manuscripts for a collection of essays published in this book as a first step to promote the research at an international level.The essays of the book encompass a significant part of the current issues of the freedom of speech and media law. Apart from the fundamentals of media regulation the main subjects discussed are the regulation of the new media, the desirable limitations of the operation of the press, the regulation of public service media, the scope of the jurisdiction of the European Union in issues of media freedom, the law of libel, protection of privacy, hate speech and terrorism, commercial communications and political advertising. The objective of the editor was to ensure that this collection of papers contributes to the debates conducted in Europe, America, and other continents on the most important issues related to media law and the freedom of speech. The essays’ significant theoretical foundations and in-depth analyses will ensure that they remain important sources for a long time."